For many years Premila's vision had been particularly for women but one day while teaching at Bible college she was challenged by the responsibility teachers have. "If you pour yourself into children they can achieve anything but children are in need of good teachers who teach not just from the head but from the heart. Even poor children can become great." That day she felt God calling her to start a hostel and school for children. But not just any children - the poorest, most oppressed children in India. Premila went from village to village meeting people and looking for the most needy children. She brought them to her home and now has 35 girls living with her. Some are orphans, and the children are predominantly from the Adivasi community - one of the most oppressed people groups in the world. They originate from the jungles of India and most have never been educated. Now they are found all across India in rural and urban centres. Very few of them have jobs and as a people group they are still very very backward. In the local normal schools there is not a single Adivasi child. Premila's children are not just taught English, maths and school subjects but are also taught life skills. Most of them had never slept on a mattress, were not used to using a toilet, having a bath or washing their hair. Premila is training these children in every area, and is showing them love and giving them a chance at a better life. A church is also run within the school community, and the message of God's love is shared with the families and others in the surrounding community. Bright Hope World personnel first met Premila while she was studying at the South Asia Institute of Advanced Christian Studies (SAIACS) in Bangalore in 2002. The Principal identified Premila as a person of high integrity and vision and so on her return to the border area of India Bright Hope World stayed in touch with her. In 2004 we commenced partnering with her as she sought to help refugee women in her area (IND03). This partnership directly benefits the 35 children living with Premila and approximately 55 other children who come from outside for schooling. However the benefit will flow on to affect many families as children who had no hope of an education are educated, able to get jobs and provide financial support for their families and communities. It is also hoped the children will go back home and teach their parents what they have learned, thereby impacting another whole generation. Premila is a woman of high integrity and energy. She has a huge vision and compassion for the children she is working with and a clear strategy to implement. There are a lot of other wealthier people who want her to educate their children because the school is in English and of a high quality but Premila has remained true to her vision to help those with no hope. If this school did not exist, then the only option for these children is to attend a government school. We understand that the local government schools provide little feedback to parents and the children do not attend regularly. The main reason parents would choose to send their children to the government school is simply because the children get fed, but the education is poor. Once Premila's school started, the need for a local church for the families of the children emerged. Premila and her team now run a small church as part of the school ministry. Her brother (Ajay) works as a pastor in Nepal and visits the church at the school regularly. He conducts baptisms and meets with any of the men that require pastoral support. In 2002 Premila went to Bangalore to study at SAIACS Bible Collge for two years. After graduating in 2003 she lectured at a Bible College in Nepal for a year before coming to Siliguri and working at a seminary. It was while she was working at this seminary that she was challenged about the important need to teach children. Premila has legally adopted three of the girls living with her, Sumitra, Santa and Sanjana. There are currently ten staff working with Premila - four men and six women. One of Premila's nieces and one of her nephews live at the school and are very involved. The team is a very impressive team. They have a heart for the ministry and show a genuine love towards the girls. It is important to have good male role models in the girls' lives after the considerable abuse that many have experienced. Reuben (Premila's nephew) and Jonathan are two of the male teachers who exemplify this great example to the girls. 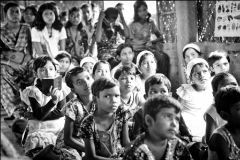 Premila's vision is to give these girls a good quality education but at the same time introduce them to the love of God and bring them to Christ. Pinkey is a 17 year old girl who has been at the school since February 2010. When she was three her father, who was an alcoholic, died and before running away with another man, her mother sold Pinkey, her four sisters and one brother to a circus in Mumbai. In the circus they had to walk the tight rope while holding a glass ball in their hand and do other acrobatic routines. They were often beaten if they couldn't do what they were asked to do. One day her brother fell off the tight rope and was eaten alive by a tiger and lion in front of Pinkey. Shortly after that the circus sold her to a family where she worked in the kitchen washing plates. This family then onsold her to another family who were Christians. They treated her nicely and she was not forced to work there. Pinkey's aunty then found her and bought her back to work in her hotel. A friend of Premila's told her about Pinkey and she contacted the aunty to see if Pinkey could come to live with her. Another of Pinkey's sisters is also at the hostel and one lives in Nepal, but she has lost contact with her other two sisters and has no idea where they are now. 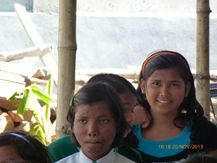 Despite being 11 years old Pinkey had never been to school before coming to Premila's school. However she loved reading and after just four months in the junior class she was able to be put up a level. She has continued to thrive and will be finishing her studies at BHES at the end of 2015. She is an extrovert and has lots of friends at the hostel. She loves God and wants to become a preacher when she leaves school. In 2013 when BHW's India Partnership Facilitators visited, Pinkey led some of the school assembly they attended. At the end of the assembly, when the other children had left, this young lady approached the team and personally thanked them for coming. This was not a pre-rehearsed moment, Pinkey just exhibited a level of maturity and engagement surprising for her age. It was an indication of the level of engagement and encouragement that Premila and her team are giving to these young women.